Well, I’ll be! 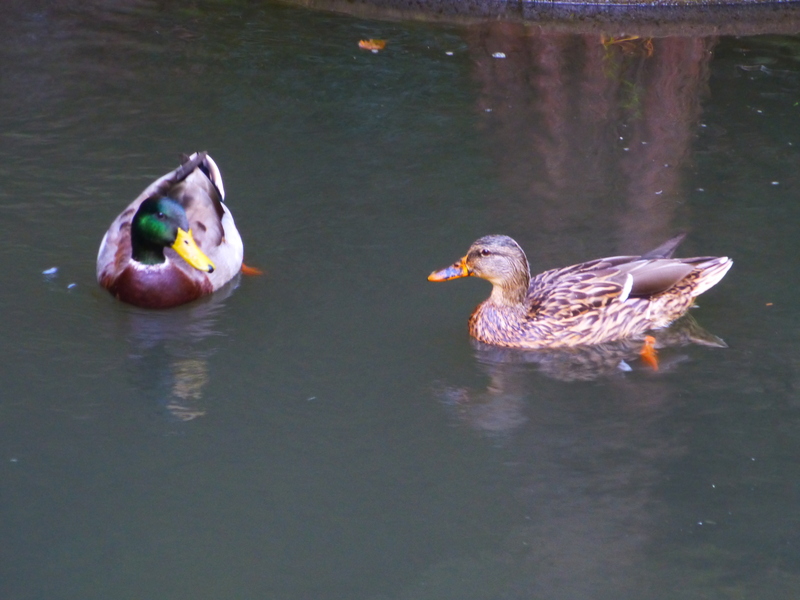 After at least a three-day absence, Honey and James have returned to the pond. I’d given up hope of ever seeing them again, at least this year. And I didn’t know if they’d left together. They look in good nick, but also ate a hearty, three-course breakfast. Of course I don’t know where they went, and never will, but I hope to have them with us until they start migrating to the “staging area” for a trip south. Here they are a few minutes ago. James and Honey—still together! 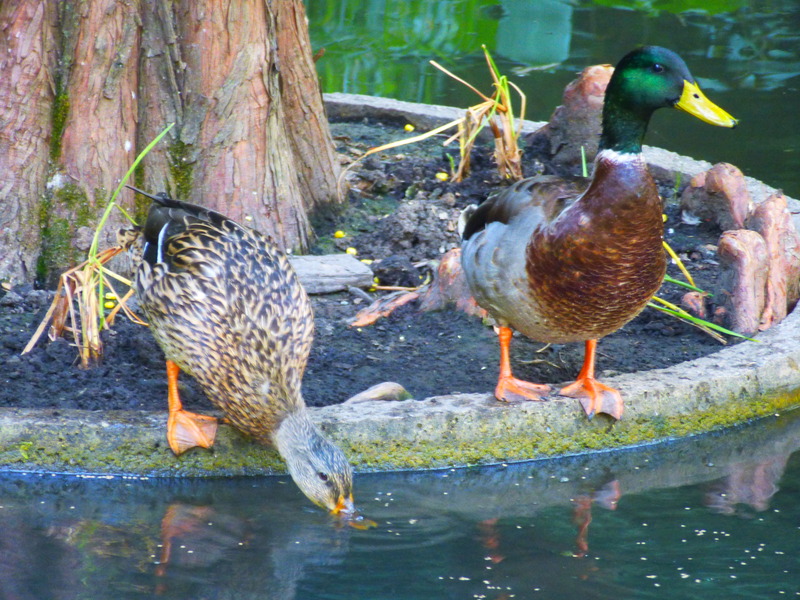 I fed them corn and duckling pellets on the newly “landscaped” Duck Island. I suppose I should order another bag of duckling food (it floats, unlike the adult duck food, and I’m told it’s just as good for non-laying adults as for ducklings). This entry was written by whyevolutionistrue and posted on September 17, 2018 at 10:30 am and filed under ducks. Bookmark the permalink. Follow any comments here with the RSS feed for this post. Both comments and trackbacks are currently closed. You do not plant full grown plants. Those will grow in the spring. And will provide cover for future ducklings. I should add that, despite the title of the post, only one quacks… or am I mistaken? James makes a very low but continual stream of quacklike noises. 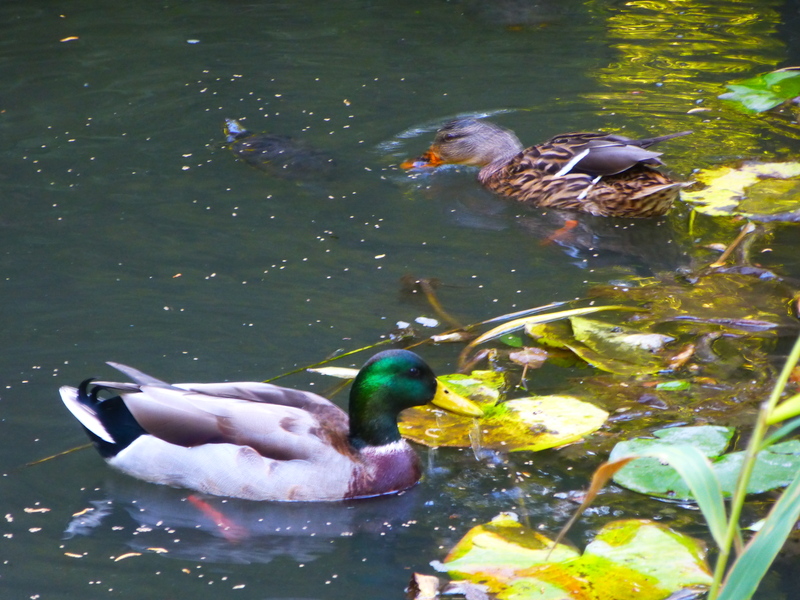 But he doesn’t make loud quacks: only female mallards do that. Betting these are plants that will reseed themselves and thrive in the spring. Someone here probably knows. I’m quite impressed by their return. You would think that with all the landscaping mayhem going on AND the fact that we’re now way past September 1 (a reasonable date to assume their imminent departure) that they’d be gone for the season. Nope! They must love that food you give them, Jerry! I’m guessing that Honey is staying here because she’s found a boyfriend and they’re busy cementing their pair bond. No reason to leave yet, as the weather is good and there’s plenty of food AND an inamorato. Ducks are supposed to leave only when there’s a first freeze or snow, and we’re a long way from that. Perhaps last year Honey went to a “staging area” with lots of ducks, looking for companionship. The question is where are the staging areas. Jackson and Washington Parks are the obvious choices. I also like Oak Woods Cemetery. I don’t think they would go farther than that. You do realize that you have turned us all into duck researchers – reading and learning all we can about these creatures. I don’t think they will leave for good before the end of October. Ducks do not really store energy. They need to stop every day and refuel. So they need resting/feeding spots (not frozen over) as they head south. I think James prefers Botany Pond. Now that he has paired with honey, one of jobs is to fend off other males. Something he does not have to do at the pond. I imagine he would like to stay there as long as possible. Yeah, that’s what I think. I just ordered another 25 pounds of duck food. Your ducks are like Kramer. If you feed them, they will never leave. Why go south when you winter warmly in the north? Hey – maybe PCC(E) can take over? They’re not scared of him, right? 16 days past last year…I wonder what has changed. Was the weather particularly bad last year in September? Honey didn’t have a mate so maybe that’s it. Looks like maybe you’ll have Their Nibs around to cater to until the first freeze. Jerry – You might consider getting the maintenance formula instead of the starter formula. It’s more appropriate for adults. I called them and talked about that; they said it was fine so long as the female wasn’t laying eggs (maintenance food has more calcium). Also, it comes in giant fifty pound bags, which seems too much. I am still giving them corn and mealworms, too. So, the maintenance food should be fed when they first come back in the spring, before she starts laying? Yes, but then it may be too late, as she comes to the pond briefly and then disappears for a month while incubating eggs. You made my day with this news, Jerry! I was hoping they’d show up, since Honey is such a smart cookie and not too easily scared away for good. What’s different about the light in these lovely photos? Did you use a special filter or setting or something? Have the ducks’ religions been determined? There could be a new dimension to raising ducks.